When one thinks of Florida, usually what is imagined is a North American paradise of beaches and palm trees. For a Florida home owner, the most common tree that borders neighborhoods are palm trees! Here at Casaplanta Trees. In fact, we love them so much we made the Palm Tree our logo! Some palm trees can grow anywhere from 20 ft to 80 ft tall! Small palm trees that grow to 20 ft are the most common in home landscapes. Either in a pot or in the yard, palm trees allow for great creative autonomy by either a mix-and-match with small flowering shrubs, or just as a stand alone wonder. Here are just three of our favorite palms, even though there are hundreds more! The reason why the Adonidia is called the “Christmas Palm” is due to the resulting development through maturity where the Adonidia blooms beautiful white flowers followed by red berries around Christmastime. These berries are actually the seeds of the palm. They are a jolly sight to see! These palms perform best in full sun so the trunk can develop a robust thickness and strong broad fronds. “Bamboo” Palm is a broad blanket term that describes all palms that have the appearance of bamboo. 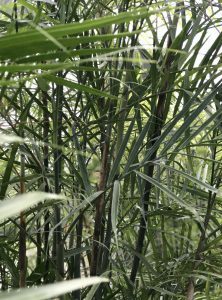 A bamboo palm can be identified by its short, out reaching attractive fronds protruding from bamboo like stalks. These palms tend to cluster together in short 7 to 10 ft tall canes. Despite its clustering nature, it does not overtake any landscape because new shoots only grow for the mother base. So that means you don’t have to worry about overgrowth. The bamboo palms can act as indoor plants throughout Florida especially during winter because the palm can not tolerate cold weather. 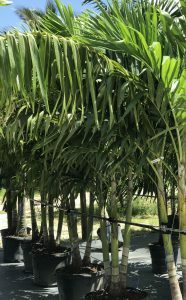 These palms should be planted in an area that is not prone to drying, such as a shaded area, planted with plenty of organic peat or compost to assist in moisture retention. Keep in mind, however, standing water isn’t ideal for this palm so the soil mixture should have enough drainage to prevent flooding. The Lady Palm is an elegant, cluster palm whose thin trunks are topped with umbrella like deep, green fronds. 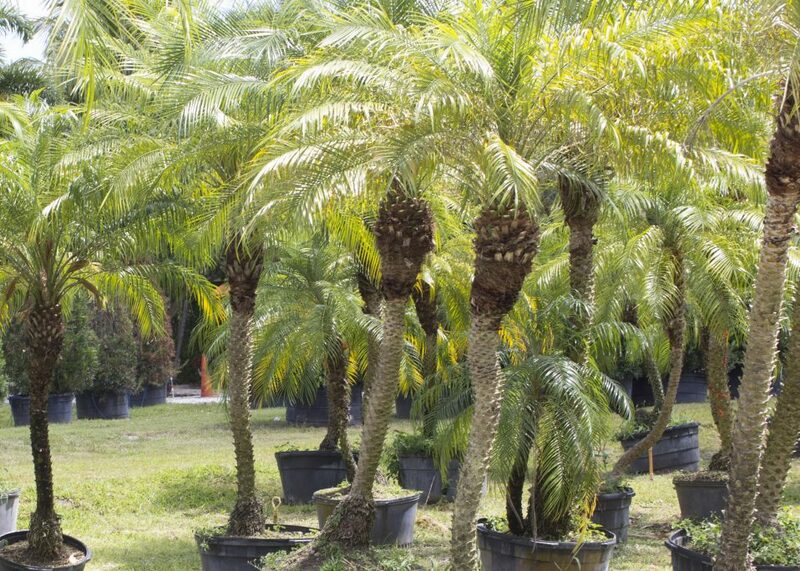 As a cluster, the palms are slow growing and develop a rounded shape that allows for a tropical yet formal appearance for your lawn or yard. The Lady Palm grows 8 to 10 ft and is easily maintained. They grow best in the shade, maintaining its deep green look, and are moderately cold tolerant. 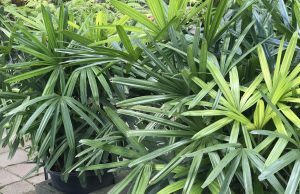 This palm thrives best in organic peat moss or compost that is moist and watered regularly. The Lady Palm has a tendency to suffer damage if it goes through long dry spells so be sure to keep them hydrated!